Improve your self confidence with Implant Dentistry. Why feel self-conscious or embarassed about your smile any longer? With implant dentistry, we can repair your smile comfortably and restore your optimal dental health with natural looking restorations. Tired of denture cleaning routines, adhesives or slippage. All on Four is one of the most exciting new techniques that allows denture wearers to feel as if they have their teeth back. Made by Nobel Biocare. 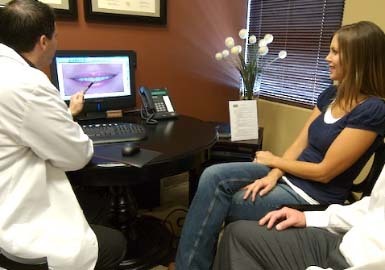 We shade match and contour all fillings to look like your real teeth. CEREC - same day Porcelain Inlays and Onlays (Currently the longest lasting restorations in Dentistry). Dental implants are small posts used to replace missing teeth roots. Dental implants provide the closest replacement option to your natural teeth so patients can smile without embarrassment and eat with confidence.